The Reporter looks at the 2015 McGill-Centraide campaign, the people who behind this record-breaking success and how the Centraide grassroots network is working to break the cycle of poverty and social exclusion for thousands of Montrealers. “We did it!” That was the subject line of an email circulated to the McGill-Centraide campaign committee members on December 4, the last day of official canvassing on campus. Volunteers began celebrating what was a record-breaking tally – almost exactly $500,000 – and that wasn’t even the end of it. By December 31, when Centraide closed the books on 2015, McGill campaign manager Brett Hooton says the University community raised more than $525,000 – $50,000 above its original goal. By breaking the $500,000 mark, McGill will join the ranks of major corporations and organizations such as Bell, Scotiabank and the Ville de Montréal among the “Top 100 Campaigns.” The grand total raised by the McGill-Centraide campaign will be announced in the New Year. 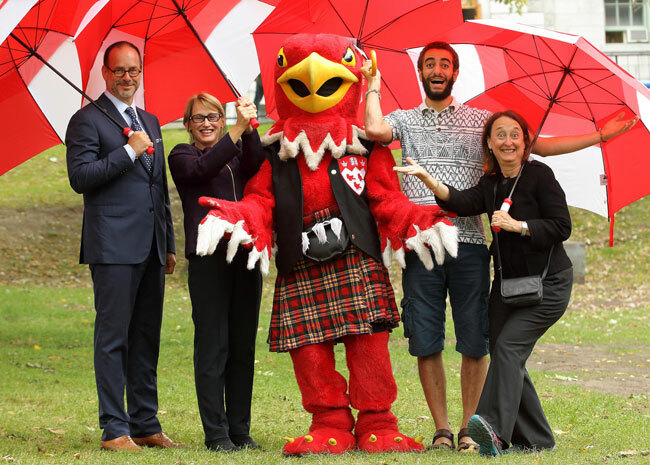 Each year for the last two decades, the McGill community has come together to raise funds for Centraide of Greater Montreal, which is an umbrella organization for approximately 370 organizations and projects that assist low-income individuals in Montreal, Laval and the South Shore. In Greater Montreal, one out of seven people receives support from an agency in Centraide’s network. Whether they’re fighting hunger, helping immigrants settle into their new neighbourhoods, or supporting youth success, the diverse organizations in the network share a mission: investing resources locally in order to break the cycle of poverty and social exclusion. Beginning in September, just under 30 volunteers from McGill’s faculties and units have donated their time and energy to coordinate fundraising events such as bake and samosa sales, athletics events, local artisan showcases, and pancake breakfasts. Volunteers were also ambassadors for Centraide, frequently taking time out of the work day to inform colleagues about the work performed at the more than 360 Centraide-supported agencies. The Reporter profiled some of the campaign members throughout the campaign, many of whom are also volunteers for Centraide-supported agencies. SSMU took an active role in the campaign this year, raising more than $1,600 through various events such as an apartment crawl and a pub night at McGill’s campus bar, as well as by selling raffle tickets for students living in residence. The Chromatones, a popular campus a cappella group, donated a portion of ticket sales from their fall concert to the campaign. Three lucky donors received calls on Friday informing them they had been selected as winners of Montreal Canadiens hockey tickets, which were donated to the campaign by members of the McGill community. Another McGill donor spilt the winnings of the University-wide 50/50 draw, a total of $485. View highlights from the campaign on the McGill-Centraide Facebook page and stay up-to-date with the campaign over the course of the year by following the @McGillCentraide on Twitter. Note: This article was updated on February 19, 2016, to reflect the final campaign figures.